Thanks for popping in. Can’t stop! Got something important to finish for the Hochanda TV show on Saturday. – The Clarity 25th Anniversary Show. Do you ever start something, and then – about 8 hours later – wish you hadn’t! However, now you’ve spent 8 hours on it, you HAVE to finish it!! But on an A to Z scale, you’re only on J ?????? Scheißenhausen !!! And nope. This is not a job which can be delegated. Had it been, it would have been. About 7 hours ago! In the meantime, we are ramping up the party. Knowing what I know about what’s coming up this weekend, I thought it might be smart to have a Parchment sale. Believe you me, you’ll be using more than before!!! 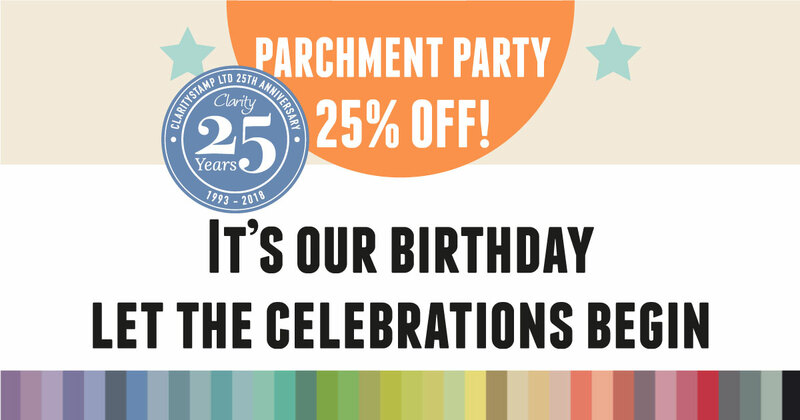 We have a superb collection of top quality coloured parchment, and it’s our 25th year in business, let’s take 25% off the price! Add your club discount, and you’ve got a baaaaarginn! Gotta go. It’s still a few hour to Z for Zebedee. Fresh Cut Scraps – love it!!! Thank you for giving us the heads up about the parchment sale. As I already have Tina’s floral and rosy doodle plates and borders I can splash out on the parchment. I’ve cleared the credit card in anticipation of a big spend in the ODS as I know you will come up with an absolute must have. Panic, worry and trying to rush only makes things worse, so take a few deep breaths, think calm, and you will get through the prep like the professional you are. That’s a fantastic offer, thank you very much. I’m going to pop over to the website in the morning once I’ve worked out which colours I need/want. Can I ask a very silly question? What is the difference between parchment and translucent paper – or am I being a bit thick? You are certainly wetting our appetite for the weekend aren’t you! Will watch Tina’s shows guilt free as I’ve already got those goodies thankfully. I think Dave is going to have a fit when all my parcels arrive from Hochanda and Clarity!! Hopefully he’ll be put when they arrive! Wow what a fantastic offer, I thought I’d stocked up a little while ago but I might need a little peek! There’s nothing worse than working to a deadline and wishing you hadn’t started something. Hopefully when you look at it again in the morning it will not seem so bad.